Avira, best known for its Free Antivirus program for Windows, released a new product called Avira Free Security Suite 2017 with the traditional 2017 refresh of its product lineup. As a user, you are probably wondering how the new product differs from the Free Antivirus, and whether you should pick the classic product or the new one if you are an Avira customer or consider becoming one. To make it simple: Avira Free Security Suite 2017 is a software bundle that includes the company's Free Antivirus for Windows and other products. What those other products are? Browser Safety, Phantom VPN and System Speedup. These products are also available as standalone downloads from Avira. 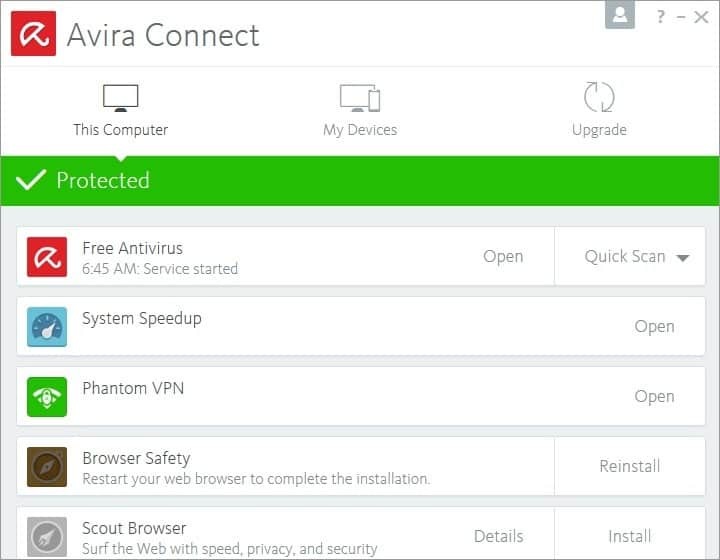 You install Avira Free Security Suite 2017 by downloading a small stub from the Avira website that triggers the network installation of the security program suite on the device when run. Basically, what it does is install Avira Connect, the company's program manager and launcher, and then the products that ship with the security suite bundle. There is no customizing of what gets installed which means it is an all or nothing approach. If you just need some of the products included, you are better off installing them individually. Also, and this needs to be mentioned, you are not getting the full versions or unrestricted versions of some of the products. For Avira Phantom VPN for instance, you get 500 Megabyte of free data per month. That's not a whole lot and can be burned through quickly in a matter of minutes depending on how you are using the computer. Even with conservative use, you may end up running out of data quickly. Assuming that a modern site has 1 Megabyte of data, you'd be able to visit 500 sites or pages before the thing runs out. The situation is a tad different for Avira System Speedup. What you get is a free trial version of the full product. When you start it up, you are reminded right away that you are running a trial version, and that it will expire soon. The core of the suite, Avira Free Antivirus for Windows, is the 2017 version of the security program. This means that you can take advantage of all the improvements that went into the program. According to Avira, this means better protection against ransomware attacks. There is also Browser Safety, another product that is part of Avira's new security suite. It adds a third-party safe browsing implementation to the browser that protects users from malicious sites, dangerous downloads and potentially unwanted programs. It dies ship with Avira Price Comparison on top of that however so keep that in mind. Avira Free Security Suite 2017 is not your typical security suite bundle that you'd expect. It does not ship with a firewall or improved security tools. That's understandable considering that those are found in the commercial security suites that Avira offers. If you look at it from a user perspective, there is little that the suite offers that you don't get when you install the products individually. Considering that you get a trial version and a very limited VPN software, most customers may be better off just installing the free antivirus product on their machines. Now You: What's your take on Avira Free Security Suite 2017? You only gave 2 stars. So it’s not that good, right? I like Windows Defender, I can save time everytime I reinstall Windows. Well, I don’t think the suite adds anything to your system security. You can install Avira Free Antivirus, and if you want any of the programs as standalones, and get the same thing minus the programs you don’t need. Nothing new under the sun so the two stars is about right. As I understand Avira integrates the MS firewall into their AV app. I am happy with the product so I will continue using it. Hey, 500MB of free VPN isn’t that bad. Of course, the whole point of this suite is to monetize on the free Anti-Virus, which many people never bother to upgrade to paid version. This way, at least they will get some revenue coming. Nothing in the “suite” that I would want. I tried Avira Free Antivirus, and I liked it because it didn’t use a huge amount of memory, nor did it prod me to upgrade. However, it was unable to update its virus definitions. I found out, via their forums, that this was an ongoing problem, and the company did not seem interested in fixing it. I gave up and uninstalled it. That’s the kind of cr.p that I notice installed whenever someone tells me that their PC is slow. Easily recognisable just by their awful interface. You can uninstall the VPN and the system speedup. It is not the end of the world if they tried to bundle together the software. The antivirus is still top notch. Agreed, but you could also just install the antivirus then without those troubles. Martin, the monthly quota for the free version of Avira Phantom VPN increases to 1GB with registration. I like Avira’s AV but I started experiencing issues with it in Windows 10. About every 7 days or so the real time protection service would stop working. Its status in Services would show “running” but, according to Avira’s interface, it was not. Nothing would fix it except for a re-install, which was a pain in the you know what. So I ended up uninstalling it and switching to Sophos Home, which I’m very happy with. It was good until they made the Avira Launcher a mandatory thing a couple of updates ago. Before that, you were able to disable the launcher in msconfig/Autoruns/any autostart manager and it switched back to being only an anti-virus, but now without the Launcher allowed to start, the whole thing turns off and you end up with 0 protection. So it’s either a useless launcher that hogs resources, creates an account for your device and does god knows what. Yes, Avira Launcher bundle-ware is for most people just an unnecessary resources hog. It should be user selectable. And since recently they give free users no option regarding the type of action they’d want to use if any infected file is found. It means you can not choose IGNORING the false posititives. Well, I am still using it, but it is just a matter of time because of these issues. No possibility of choosing the type of action to be done when infection found being the major issue. under “Product Installation Files” the actual antivirus installer is there. i don’t know if the “offline installer” (as i call it) comes with the launcher or not, because i’m downloading it now. Good point. Link changed. Thanks!